Corporate fitness – or the fitness of the staff of a corporate company or organisation is moving centre stage in a progressive company’s thinking. Traditionally, a focus on sports and fitness made the organisation more attractive as a place of work. More recently, companies and organisations have realised that healthy and fit staff means better productivity and less time out of work with chronic illnesses or doctor / hospital appointments. …and therefore, anti-discrimination employment laws may apply. 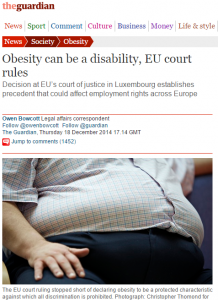 Organisations are, therefore, left with a potential legal risk of failing to deal with obesity adequately. Now, whilst it is clear that employers will need to re-kit there offices and premises to provide larger chairs and facilities they also face the financial risk of lower productivity cost of their larger employees, as these people will face a range of additional health issues which may affect their ability to both turn up in work and be effective when in work..
Lastly, employers who require their staff to work in sedentary jobs – desk based, car based, truck based – may find themselves at risk of employee action in future years if the organisation does not take an interest in encouraging staff to look after themselves, exercise moderately and eat healthily. And, of course the obesity is getting worse – that is, it is affecting more and more people. 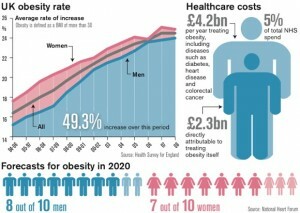 As you can see, this graphic shows that by 2020 80% of men and 70% of women will be overweight or obese in the UK. Yes, there is now little doubt that an increase in weight or obesity raises a person’s risk of a whole host of potential chronic conditions and illnesses. These include higher levels of diabetes, back aches, great risk of depression, lower motivation, arthritis issues, higher risk of cancer, high risk of heart disease and generally a lower productivity. Our concern for the member of the team with any of these conditions is considerable and at the same time, companies and organisations need to consider the impact on productivity when key members of staff need to attend weekly or fortnightly doctors and nurse appointments to assess and monitor their conditions, let alone the issues and challenges of the more serious illnesses. There is even the view that the cost of staff coming to work tired or not feeling particular well due to back pain, niggles, lack of energy etc is costing UK companies £15bn per year. That is almost twice the cost of staff absence, so it is now becoming the key issue. There are a number of issues that a company will need to deal with around the risk of employee obesity, however, the first and simplest is to establish fitness and healthy living as a core company value and back that up by low cost action. Our recommended approach to this issue would be to invite every member of staff to join a company or organisation sponsored Fitness programme – based on moderate exercise and healthy living – and to incorporate ‘active’ company sponsored events around walks, runs, cycling events etc…into the company year. Our Clean 9 and FIT programme is unique in that it does not require a gym nor a full time fitness trainer. It can be supported by a trained advisor either face to face – or via a social media group and therefore can be delivered at very low cost. Shared fitness experiences will also help to bring teams together and foster better working relationships across the company. Hence, the impact per pound spent of the traditional gym option may not give best results. Through using our Clean 9, Forever FIT 1 and FIT 2 packs, no only do your members of staff have fitness and weight management programmes based on sound nutritional principles, but they also follow a structured course which helps them lock in healthier eating and better (moderate) exercise. the programme also allows existing HR or fitness / occupational health staff to deliver and support the programme locally. Lastly, the costs can be structured to meet the financial needs of the organisation. Or, the company can choose to subsidise the packs further or fully or, possibly, offer the fitness packs as an incentive for performance. Please contact us or one of our Fitness Advisors for more information. I guess you mean a bottle of aloe vera gel? Well nearly 99.9% of people can use and benefit from it – the only exception would be if you are alergic to garlic or onions – in which case, you should just try a drop first (this is very rare). And I also got pains on my periods time the one who selling it she that bottle is good for me .is that true or she want me to buy for her? Aloe vera is good for 99% of people – so unless you are a severe diabetic or similar, then I’m sure it will be fine.